Background: Low-income racial/ethnic minority women are disproportionately represented in substance use and intimate partner violence (IPV) among those who are at risk for or live with HIV– collectively called the SAVA syndemic. Little is known about how IPV exposure and substance use impact HIV testing uptake among low-income racial/ethnic minority women. Aim: The objective of the current study is to conduct systematic literature review of SAVA syndemic on HIV testing among women. Design/Methods: A systematic literature review was conducted between February and September 2016 using databases of PubMed, Ovid/Medline, PsychINFO, Embase, and CINHAL/Nursing. Quantitative and qualitative peer-reviewed studies published in English that covered the topics of HIV testing, women, IPV, and substance use were reviewed. Study contents were summarized and reviewed to identify the gap in studying the impact of substance use and IPV on HIV testing in women. 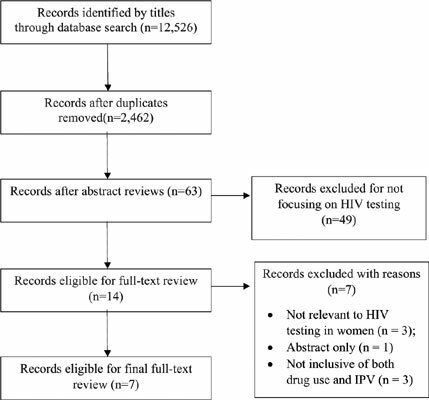 Results: Among women at risk for substance use and IPV (N = 6,259), HIV testing was perceived to be a priority especially if they were injecting drugs and engaging in risky sexual practice; however, barriers were also identified including stigma, privacy issue, convenience, and fear of receiving an HIV-positive result. Conclusions: Findings were informative in meeting the needs of HIV testing and counseling for women at risk for substance use and IPV while addressing the potential barriers to increase access to the service. HIV testing, women, substance abuse, intimate partner violence, review, SAVA syndemic.